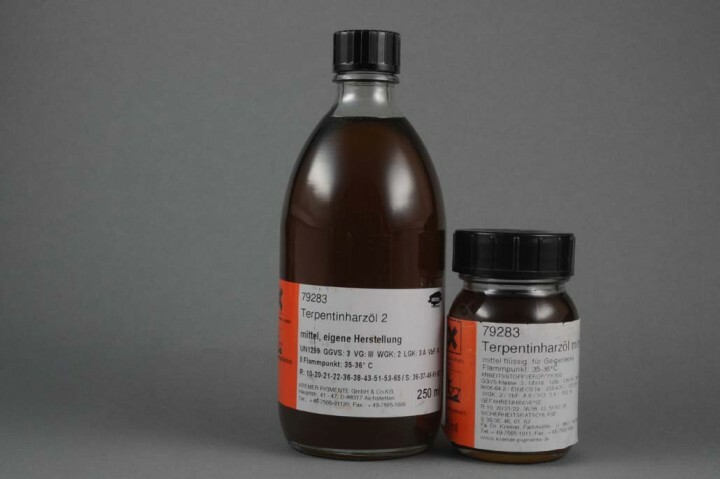 Turpentine Rosin Oil medium | Varnishes | Solvent-soluble Binders | Mediums, Binders & Glues | Kremer Pigments Inc. DANGER: COMBUSTIBLE. HARMFUL OR FATAL IF SWALLOWED. VAPOR HARMFUL. EYE IRRITANT. EXPOSURE MAY CAUSE ALLERGIC REACTIONS. SKIN CONTACT MAY CAUSE ALLERGIC SKIN RASHES. 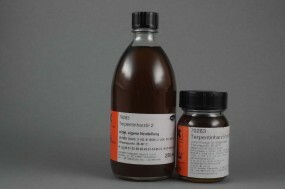 Contains: D-LIMONENE, DELTA-3-CARENE, ROSIN, TURPENTINE. PRECAUTIONS: Avoid prolonged contact with skin, and ingestion. Wash hands immediately after use. When using do not eat, drink or smoke. Keep away from eyes. Do not store or use near heat or flame. Keep container tightly capped when not in use. Use only with adequate ventilation. KEEP OUT OF REACH OF CHILDREN. FIRST AID TREATMENT: If eye contact occurs, rinse with tap water for 5-10 minutes. If irritation persists, seek medical care. If swallowed, do not induce vomitting. Call a physician or poison control center immediately. If inhalation symptoms occur, move to fresh air. Get prompt medical attention. For further health information contact a poison control center or call 212.219.2394. Customer evaluation for "Turpentine Rosin Oil medium"